Go all out this year with your Christmas decorations and push things up a notch with a multi-color LED tree! These glimmering trees offer an amazing light display as the lovely LED lights dance across all the branches. The LED lights run through a 9-color pattern, giving a fun show and the star tree topper lights up in unison with the colors. The cycle automatically starts every four minutes (the pattern of the lights cannot be controlled). Lightweight tree has a powder-coated frame (for a real-life snow effect) and stands on a hanging base that easily folds for compact storage. The trees come in three different sizes and needs simple assembly to set up. An amazing light display with LED lights dancing across every branch. LED lights automatically run through a 9-color pattern. The star tree topper lights up in unison with the colors. Cycle automatically starts every four minutes (the pattern of the lights cannot be controlled). 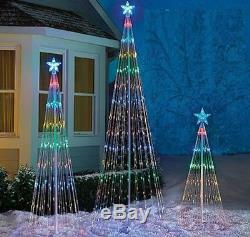 Sizes: 4' tall, 24-Diameter, 152 lights. 6' tall, 28-Diameter, 200 lights. 9' tall, 36-Diameter, 344 lights. Powder-coated frame (for a real-life snow effect). Stands on a hanging base that easily folds for compact storage. The item "Lighted Led Tree Outdoor Christmas Holiday Decoration 4' 6' or 8' FT Multi Color" is in sale since Monday, June 25, 2018. This item is in the category "Home & Garden\Holiday & Seasonal Décor\Christmas & Winter\Yard Décor". The seller is "usabestdeals1982" and is located in Downingtown, Pennsylvania. This item can be shipped to United States, Canada, Denmark, Romania, Slovakia, Bulgaria, Czech republic, Finland, Hungary, Latvia, Lithuania, Malta, Estonia, Australia, Greece, Portugal, Cyprus, Slovenia, Japan, China, Sweden, South Korea, Indonesia, Taiwan, South africa, Thailand, Belgium, France, Hong Kong, Ireland, Netherlands, Poland, Spain, Italy, Germany, Austria, Israel, Mexico, New Zealand, Philippines, Singapore, Switzerland, Norway, Saudi arabia, Ukraine, United arab emirates, Qatar, Kuwait, Bahrain, Croatia, Malaysia, Brazil, Chile, Colombia, Costa rica, Dominican republic, Panama, Trinidad and tobago, Guatemala, El salvador, Honduras, Jamaica, Antigua and barbuda, Aruba, Belize, Dominica, Grenada, Saint kitts and nevis, Saint lucia, Montserrat, Turks and caicos islands, Barbados, Bangladesh, Bermuda, Brunei darussalam, Bolivia, Ecuador, Egypt, French guiana, Guernsey, Gibraltar, Guadeloupe, Iceland, Jersey, Jordan, Cambodia, Cayman islands, Liechtenstein, Sri lanka, Luxembourg, Monaco, Macao, Martinique, Maldives, Nicaragua, Oman, Peru, Pakistan, Paraguay, Reunion.